What’s going on with Disney lately? Most of their animated features have been given good-to-great treatment on Blu-ray (though I haven’t seen the infamous Sword and the Stone yet, kind of afraid to after all the negative press about a shoddy HD transfer). Some of their recent double features, combining movies such as Emperor’s New Groove and Lilo & Stitch with their direct-to-video sequels, have been great values. But as we surge into the 2013 holiday season, Disney is trying to pick our pockets with their BD debuts of Mickey’s Christmas Carol and Winnie the Pooh: A Very Merry Pooh Year. Each carries a list price of $36.99, which means that even discounted on sites like Amazon, you’re still shelling out $26 or so. That’s for animated shorts, not feature-length films. Maybe together on a single disc that price would be acceptable. 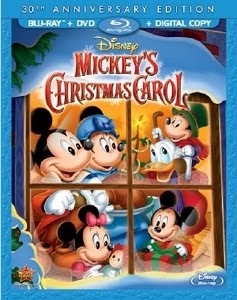 Let’s start with Mickey’s Christmas Carol. 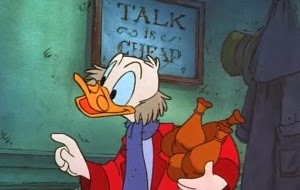 This Scrooge McDuck and Mickey Mouse spin on Charles Dickens’ classic A Christmas Carol has been a holiday favorite for millions of families since it debuted in 1983, attached to the theatrical reissue of The Rescuers. With Donald Duck, Goofy, Jiminy Cricket, and many other beloved characters, this retelling of what is possibly the quintessential Christmas tale continues to charm even three decades later. But it’s only 26 minutes long. Shouldn’t it be bargain-priced? To add insult to injury, Disney has scrubbed the grain and fine detail right out of the image, leaving Carol looking nearly like a smooth, soft-focus approximation of contemporary CG animation. It’s not like it’s unwatchable, especially for young kids who aren’t scrutinizing the integrity of the transfer, but it isn’t representative of the film’s original appearance. The only saving grace is the inclusion of 33 minutes of bonus shorts: the brand-new “Yodelberg,” along with “The Hockey Champ” (1939), “The Art of Skiing” (1941), “Corn Chips” (1951), and “Pluto’s Christmas Tree” (1952). But that’s a pretty paltry package, given the relatively hefty price tag. Though not nearly as beloved, A Very Merry Pooh Year is the marginally better choice. This direct-to-video special actually combines two separate Winnie the Pooh programs. In 2002, the 1991, 26-minute TV special Winnie the Pooh and Christmas Too was recycled as a “flashback” within the then-new special Happy Pooh Year. The result is a 64-minute film that functions as a gentle, fun-for-kids celebration of the Christmas spirit. It’s Christmas Eve in the Hundred Acre Wood. Pooh and the gang remember the year when their gift-request letter wound up in Pooh’s hands instead of Santa’s (that’s the ’91 portion). The ’02 story involves a New Year’s celebration where Rabbit threatened to leave the Wood, forcing everyone to resolve to change their annoying personality tics. 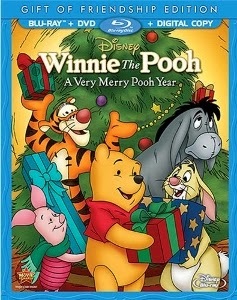 Pooh Year is no classic, but at least it does look better in high definition than Mickey’s Christmas Carol. That’s not saying much, especially since the 2002 footage was far from the most inspired Disney animation to begin with. It looks kind of washed-out, while the ’91 material benefits from bolder colors. Neither Pooh nor Carol were granted lossless audio tracks; both have adequate though lossy Dolby Digital 2.0 mixes. And Pooh, despite the longer running time of the main attraction, has no real bonus features (sing-along versions of the special’s musical numbers and a useless screensaver-type “feature” that displays a barely-animated living room for 24 minutes). While I know that many families will want to add both these titles to their collections, do some bargain hunting before paying anywhere near list price. And if you already have these titles on DVD, I can’t really recommend upgrading. At least both releases do include a standard DVD and digital copy, but these two Christmas titles are overpriced and underwhelming.